Marcos Alonso scored a late header which sealed Chelsea’s 1-0 away win over Slavia Prague. Here's the Warm Down. Neither side were able to break the deadlock in the first half. Chelsea dominated possession, however, failed to make their chances count. It wasn’t long into the second half until Maurizio Sarri felt the services of Eden Hazard were required, along with N’Golo Kante and Ruben Loftus-Cheek. With just five minutes to spare, Marcos Alonso headed Chelsea into the lead. Alonso’s late goal may prove pivotal in the Blues’ Europa League campaign as they return to Stamford Bridge in a week with an away goal on their side. Chelsea dominated much of the possession throughout the game, however, failed to showcase any ruthlessness in front of goal. Slavia Prague frustrated the Blues, continued to commit fouls which lead to the break-up of play and interrupted any fluidity in the away side’s play. Minutes before Chelsea took the lead, Jorginho passed the ball beyond Ondřej Kolář into an open net. However, Olivier Giroud, the provider, was previously flagged for offside. 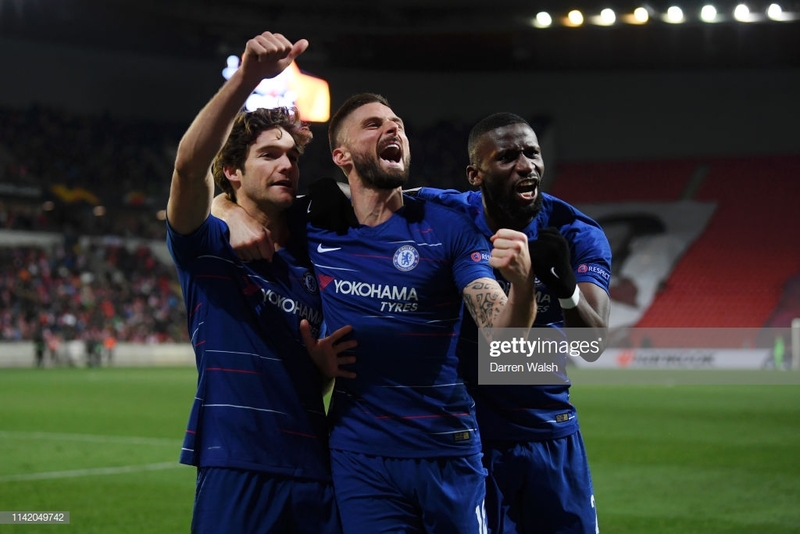 Chelsea’s midfield trio of Mateo Kovacic, Jorginho and Ross Barkley appeared to lack an injection of pace when on the break, however, they retained the ball well. The arrival of Loftus-Cheek offered a greater physical presence and threat going forward. Chelsea’s away goal will prove crucial when the Czech side arrive for the second leg at Stamford Bridge. However, a marginal lead will not necessarily sway Sarri to field a ‘lesser side’ with it all to play for. Sarri’s side faces Liverpool on Sunday, and players such as Callum Hudson-Odoi, Emerson, Kante and David Luiz were rested. In contrast, The Blues were forced to bring on the likes of Hazard and Loftus-Cheek who could have been in Sarri’s plans for Sunday. Antonio Rudiger was named man of the match. The German international made a total of 81 passes and helped keep the club’s eighth clean sheet of the Europa League 2018/19 campaign.